Heat oven to 450°F. In ungreased 15x10x1-inch pan, spread bell pepper, onion, zucchini and mushrooms. In small bowl, mix oil, basil, salt and pepper; brush over vegetables. Bake uncovered 12 to 15 minutes or until crisp-tender. Cool slightly. Meanwhile, in another small bowl, mix mayonnaise ingredients. Spread about 2 teaspoons mayonnaise mixture down center of each tortilla to within 2 inches of bottom. 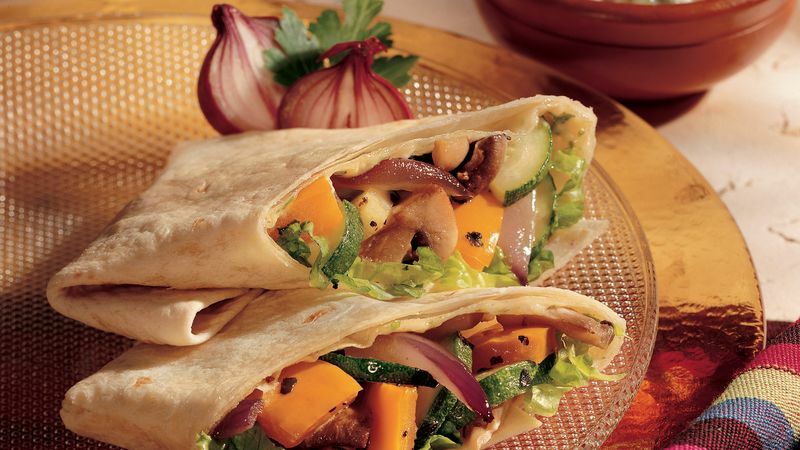 Top each tortilla evenly with roasted vegetables, spreading to within 2 inches of bottom. Top each with 1/4 cup lettuce. Fold one end of each tortilla up about 1 inch over filling; fold right and left sides over folded end, overlapping. Fold remaining end down. If you love garlic but hate to chop it, keep those handy little jars of chopped garlic on hand. Grilled Chicken and Roasted Vegetable Wraps with Garlic Mayonnaise: Use 8 tortillas. Thinly slice 2 warm or chilled grilled boneless skinless chicken breast halves. Arrange chicken on vegetables in step 3.